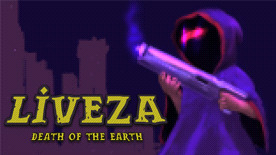 Liveza: Death of the Earth - a classic platformer. A global catastrophe has literally torn our planet apart, breaking Earth into many pieces. You are the survivor that explores the remains of our planet and investigates the anomalies that have settled upon it. You start out with only a single item: a broken weapon that also functions as a flashlight. Along the way, as you fight off dangerous creatures, you will find useful tools that will help you jump great distances, slow down the passage of time, or even find hidden objects that you otherwise cannot see.